Brita used the stars to create 'thumb-stopping power' among its target consumer: millennials. 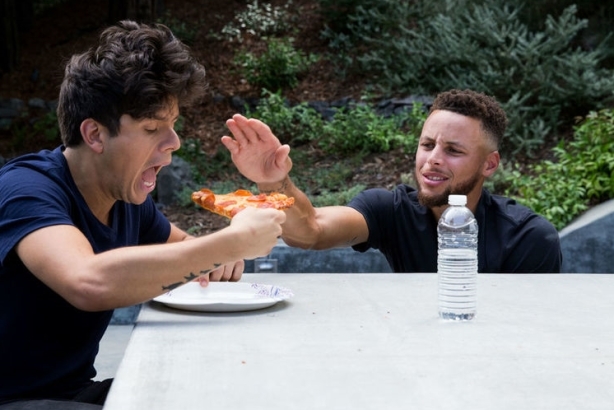 Brita created a music video featuring NBA star Stephen Curry helping social media celebrity Rudy Mancuso to successfully follow-through with his New Year's resolution to ditch bottled water by using the brand’s water filters. It includes a tune consumers will soon not forget. Brita and its creative and digital partner for the campaign, Portal A, began conceptualizing the campaign in July 2017. "Our goal is for people rethink the habit of drinking bottled water," explained Yating Wong, Brita’s associate brand director. "We also know that to engage jaded consumers, especially millennials, you have to create thumb-stopping power in unexpected ways." Brita looked to create a New Year’s themed video featuring Curry, who signed a three-year sponsorship deal to be brand spokesperson back in March 2016. The brand partnered with Mancuso to help bring a comedic element to the video alongside Curry. On YouTube, Mancuso has over 4.1 million subscribers. He also has more than 6.1 million Instagram followers and more than 1 million followers on Twitter. "[Mancuso] is someone that truly resonates with our target [audience], has a loyal following, and is wildly creative, especially when paired with Stephen Curry," said Wong. Brita produced the video during the first week of September 2017. On January 4, 2018, Brita launched the New Year, New Me video on Mancuso’s YouTube channel. By the next day, the video hit number four on YouTube’s top trending video list. As part of the campaign, Brita also partnered with the Golden State Warriors to offer a chance to win free game tickets to those who retweeted a short-form video posted on the brand’s Twitter page. On January 15, the brand released a behind-the-scenes video of the film on its YouTube channel. "We truly believe in the magic that comes with allowing our brand ambassadors to be themselves and live our brand purpose," added Wong. "We would never have scripted the kind of content that [Curry and Mancuso] were able to riff on the spot." Both Mancuso and Curry shared clips and videos on their respective social channels, which helped amplify the reach of the campaign. One of Mancuso’s Instagram posts about the campaign received nearly 220,000 favorites. Since its January release, the New Year, New Me video has been viewed on YouTube more than 6.3 million times. Despite being a paid promotion, the video was well-received by audiences, with more than 210,000 likes and 4,000 dislikes. The video also garnered 35 media placements in outlets including GQ, NBC Bay Area, Men’s Health, and Washington Post.